The plea-bargain of the slaughterhouse JBS announced the night of this Wednesday (17), which proves the involvement of president Michel Temer (PMDB) in buying the silence of ex deputy Eduardo Cunha (PMDB), imprisoned October 2016, shatters the smoke curtain that hid the degree of participation of this administration in corruption. The plea-bargain proves the reforms and projects proposed by the Temer administration were linked to a great schema that answered only to his own interests. The labor and pensions reforms are tools to remain in this great schema where the beneficiaries are bankers, great enterprises and agribusiness, all based on corruption. Before the facts exposed, the CSP-Conlutas reaffirms neither Michel Temer nor the politicians of the National Congress have moral to adopt or even include in the agenda projects to withdraw rights and lower the achievements of workers. These achievements are the result of decades of struggle by the working class, for example the pensions and the rights contained in the CLT (Consolidation of Brazilian Labor Laws). Neither will we accept this corrupt congress attempting to impose an alternative that implies the continuity of the current regime. In the current scenario, the continuity of Michel Temer in office is completely unsustainable. If he did not resign, he will fall by work of the people. 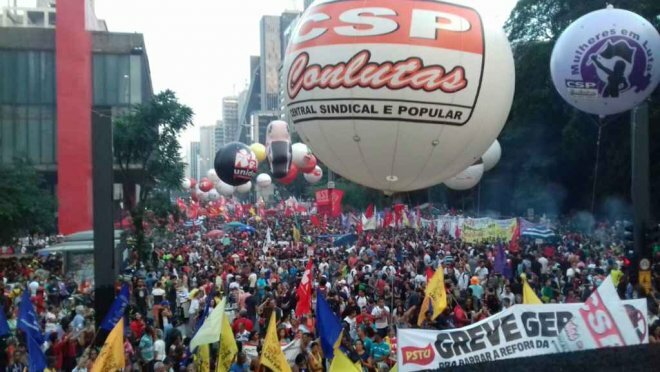 The CSP-Conlutas summons all the workers of Brazil to occupy the streets from today and strengthen further the march to Brasilia. One hundred thousand in the federal capital next May 24 will be few. To organize and strengthen the rank committees in the workplaces, neighborhood, schools, universities, among sectors, popular movements and youth. Enough ! Let us go to the streets in the entire country from now. Let us occupy Brasilia and prepare the 48-hour General Strike. The strength of the April 28 General Strike and the national struggle days of March 8th and 15th showed the workers and people have conditions to stop this country, to overthrow the government and burry its reforms. It is necessary for the union federations to summon immediately a new General Strike, this time for 48 hours. 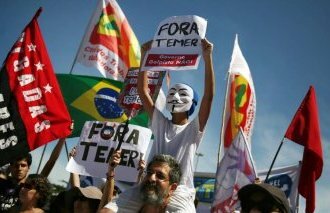 – Out with Temer and the corrupt politicians of the National Congress, now. – For the withdrawal of the labor and pensions reform bills. – For the revoking of the outsourcing law, of the high school reform and the constitutional emend 95. – 48-hour General Strike !